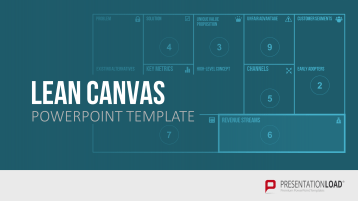 A practical bundle containing high-quality PowerPoint templates for Product Canvas, Business Model Canvas, Lean Canvas, and Design Thinking Canvas. Clearly illustrate your business model with our Business Model Canvas and Lean Canvas templates. 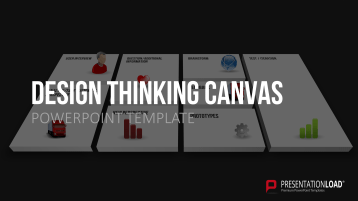 In addition, you can develop innovative processes and products with our professionally designed Product Canvas and Design Thinking Canvas slides. The Business Model Canvas gives you a clear overview of your business model on a single PowerPoint slide. This consists of nine modules: customer segment, value proposition, communication and sales channels, customer relationship, revenue streams, key resources, key activities, key partners and cost structure. The canvas shows you all business modules at a glance and allows you to update the individual segments at any time. The Lean Canvas is a modified form of the Business Model Canvas. It is a particularly useful tool for lean startups to clearly present their business model. 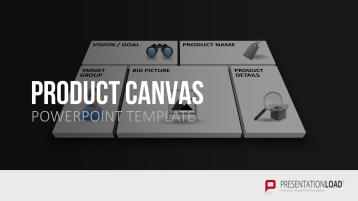 The Product Canvas focuses on product development requirements and consists of five quadrants – vision/goal, name, target group, big picture, and product details – arranged on a canvas. These fields can be filled in with relevant information and updated at any time to optimize the planning process. With the Design Thinking Canvas, you can visualize your innovation process on a single PowerPoint slide. The process consists of several steps arranged side by side on a canvas, during which different perspectives and ideas are collected. 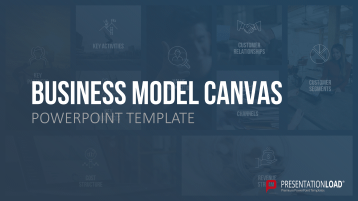 Our bundle features a large selection of professionally designed canvas templates to present business models and implement strategic product planning. The slides have a variety of designs, for example with icons and photo backgrounds. Individual design elements can be customized in shape, color, and size. Thanks for the canvas slides, I really appreciate your new product. It’s tough to structure your business model in an easy to understand fashion. These templates helped us to finalize an important presentation in style. This is pretty much the best structured template set I saw until now. The free canvas slides you can find online don’t really have this kind of detailed structure and icons/graphics. I don’t like the darker slides but I guess this is a question of personal taste. I would hope for more color schemes the next time but other than that I’m absolutely happy with this set. Also, I personally would recommend the bundle if you, like me, run a business that caters to many different branches but that’s up to you.